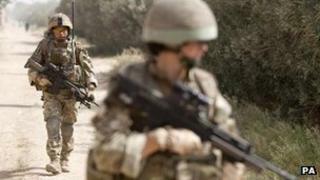 Up to 600 Afghan interpreters who worked alongside British troops are to be given the right to live in the UK. The plan marks a climbdown from ministers who had decided they should not get the same UK resettlement rights as interpreters in the Iraq conflict. A five-year visa will be offered initially to those who worked on the front line for a year or more - covering around half of interpreters. But there were concerns that a large number of them could be excluded. A Downing Street source said the proposals would give interpreters a choice either to go on working in Afghanistan or "make a new start in Britain". While details of the scheme are not expected until the end of May, lawyers said "large numbers" of interpreters might be not be covered. Rosa Curling, who acts for three of the interpreters, said she was pleased the "bravery of the Afghan interpreters now seems to have been recognised. "We are, however, concerned that some interpreters may not qualify if the scheme is only available to those employed between December 2012 and December 2014 and limited to front-line staff only, she added. "This would completely undermine the purpose of the policy." One interpreter, "Abdul", told the BBC: "We risked everything to do this job. We are glad that the British government has recognised our service and the sacrifices we made for them." The Downing Street source said: "We should recognise the service given by those who have regularly put themselves in real danger while working for us," the source added. But campaign group Avaaz, which is behind an 83,000 signature petition calling for all Afghan interpreters to be given asylum, said the plan was "too limited". It claimed to have seen documents suggesting the scheme would only be open to those who had been made redundant on or after 1 January 2013, although Downing Street said it was more likely decisions would be made on a "case-by-case basis". The Ministry of Defence said no final decisions had yet been made. Earlier this month, the prime minister had said the UK should encourage "talented Afghans to stay in their country", including a "really generous" package of support for interpreters. Labour's Yvette Cooper welcomed what she called the government's "u-turn", saying it was the "right policy" for those who risked their lives. Many of the interpreters who will be helped say they have received serious threats to their lives, while some have already fled to the UK to claim asylum. "One of my colleagues was captured, held for months and killed by the Taliban. They returned his body to his family in exchange for ransom," one former interpreter told the BBC. "Ahmad" - who worked alongside British forces at Camp Bastion - said he had grenades thrown at his house and had to leave the job because the Taliban threatened to kill him. It means a lot to me to my family and to all those interpreters who have served the British government in Afghanistan. We risked everything to do this job and we are glad that the British government has recognised our service and the sacrifices we made for them. Our friends did not abandon us to be persecuted by the Taliban. The British government has given us the chance to live once more in peace and prosperity. I would like to thank all our supporters and the British media from the bottom of my heart. They have supported us to get a peaceful life. Under the plans, those allowed into the UK on a five-year visa will then be able to apply for indefinite leave. The Border Agency will approve how many close family members they are allowed to bring. Interpreters who choose to stay in Afghanistan will be allowed to sign up for fully-funded training and education for five years, or instead be paid at their current rate for a further 18 months. Under the new plan, some other locals who had helped British soldiers in non-front-line roles, such as cooks and security guards, will also be given the choice of training and education, or further payments. After the Iraq war, Britain gave Iraqi interpreters either one-off financial assistance or exceptional indefinite leave to remain in the UK with help to relocate, or the opportunity to resettle through the UK's Gateway programme run in partnership with the UN's High Commissioner for Refugees. Is the UK abandoning its Afghan interpreters?